Nokia 6310 is a successor of Nokia 6210. This phone resembles its predecessor, which considered to be one of the most interesting business-phones. Nokia 6310 is more balanced than Nokia 6210 inresponse to size. It has almost the same dimensions (129х47х17 mm), only teh depth is 2 mm less. It was done thanks to applying a lithium-polymer battery, which is included in the standard kit. The weight of the phone is 111 grams; Nokia 6210 weighs 114 grams. Small changes of the weight can be explained by adding new features, such as Bluetooth and etc. I think that size and weight of the phone were remained unchanged, because many business users enjoyed them, it was pleasant for them to feel the handset in hands. To change a phone style, designers make a bronze insertion edged by silver. The display is the same as Nokia 6210 has, but its resolution is increased. Now it is 96x65 pixels (instead of 95x60 pixels). A rubber volume key is placed on the left-hand side. Sides and rear part of the phone are made of black plastic. Shape of gray plastic keys is a little bit changed if to compare them with keys of Nokia 6210. They became more comfortable now, but characters drawn on them are less visible: they are often blended when the backlight is switched off and badly visible in average lighting conditions. To say the truth, these characters are clearly visible at dark, but you can’t manually switch on backlighting; it is always switched on when the phone is active. Scroll key is divided into two oval keys. They are rather comfortable, as they are spaced far form each other. The phone is available in three colors: Jet Black, Sirocco Bronze and Mistral Beige. Our test sample was of Jet Black color. Others phones, which have a silver rim around the screen, look not so attractive. 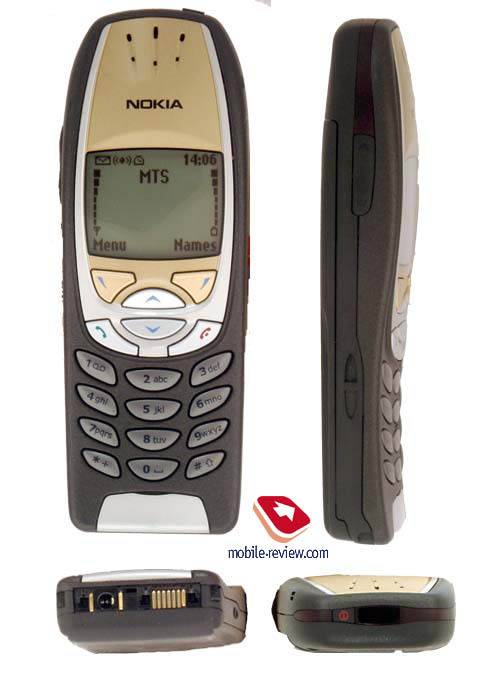 Nokia 6310 is equipped with a litium-polymer battery of 1100 mAh capacity. According to the manufacturer, it could operate up to 18 days in the standby mode and 3.5 – 5 hours in the talk mode. Excellent results! 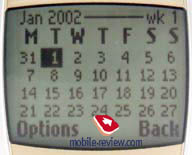 Manufacturers declared operating time of Nokia 6210 was 10 days in the standby mode. In reality a new phone could operate only 8 days in case of 45 minutes of talking; using alarm-clock and reminders. The second test sample (it was tested a little bit later) showed worse results – about 7 days in case of 40 minutes of talking. 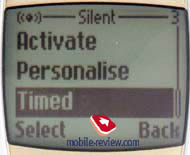 This handset operated 9.5 days (MTS network) – 10.5 days (Beeline network) in the standby mode. In any case it has much better autonomy than phone's rivals (for example, Siemens S45/ME45). Standard Battery 900 mAh NiMH (BMS-2S). This handset is comparable with old chargers too. Only time of charging differs. Like Nokia 6210, Nokia 6310 has a standard ACP-8 charger. ACP-9 - 2 hours 05 minutes. In reality approximate time of charging is 2 hours – 2 hours 10 minutes. When the battery is low, a special signal tone warns you about it once in 20 minutes, 12 hours (if you use the handset only in standby mode) before the phone turns off. Due to an increased display resolution, the battery status icon has 7 points in the new phone. Real battery charge level is not always correctly displayed on this icon. Sometimes 2 points can disappear simultaneously, but total operating time doesn’t change. Structure of the main menu remained the same. A shortcut number navigation is available, as each menu item has its own number. Let’s overview all menu items of the phone. First, few words about a phonebook. Names. A phonebook wasn’t changed too. You could record up to 3 phone numbers and text note to one entry. Totally, you can add up to 500 entries. If you decide to store up to 5 phone numbers and 4 short notes (text, e-mail or smth else), total number of entries will be less. This phone has a dynamical memory, which can be shared between applications.. There are 5 caller groups in 6310: Family, VIP, Friends, Office, Others. You can select any ringtone you like for each caller group. Up to 10 voice tags can be added to phone numbers. Up to 8 keys (2-9) can be assigned as speed dialing keys. Button "1" connects you to voice mail. Messages. This menu item is necessary to create and read SMS messages and broadcast messages as well. There are pre-installed 10 templates and 10 pre-default pictures, which could be used in the messages. Apart from using such folders as Inbox, Outbox and Archive, which you use to store messages, you can create your own folders and store your own messages there. You can’t switch languages while creating a message. It is a shortcoming of this phone, the same was in its predecessor. One can store up to 150 SMS messages (only text) and 50 graphical messages in the phone memory. As the memory is dynamical, total number of messages can’t exceed 200. Call Register. One can view lists of 10 last received, 10 dialed and 10 missed calls with date and time indication. To redial a number, it’s necessary to press a send key in the standby mode. Cost and duration counters can be found in this menu too. Profiles. Up to 5 user’s profiles can be used in the phone. 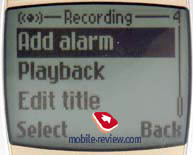 You can adjust ringing tones (totally, up to 35 ringing tones and a possibility to download up to 10 own ones), type of incoming alert (single, ascending, usual, short, silent), volume level (5 levels), vibrating alert (on/off), keypad tone, warning tones, set a filter for incoming calls (you can set special caller groups). Among new pleasant things we can notice a possibility to switch profiles in special time. It is very convenient during the meetings. For the first time this functions appeared in Nokia 8310. Bye the way, these two phones greatly resemble each in response of technical features. Settings. This menu item allows to choose a menu language, set date and time, and time and date correction according to network settings (operator dependable function). One can also set a simple alarm-clock here (only once). It can alert even when the phone is switched off. Other settings, connected with the phone, are also can be found here (GPRS settings in particular). Games. There are 4 pre-installed games in the phone: Snake II, Pairs II, Space Impact and Bumper. Nokia’s phones users have already acquainted with them. There is a possibility to use games-service, but you should register at Nokia’s site and receive a special ID to do it. Calculator. It’s standard, so, no comments. To-do list. One can record up to 30 points here and give a small note (up to 50 characters) to each one. Then, you can set a priority level (high, low, standard). It’s very convenient that a record from to-do list can be moved to a calendar to a special date. Calendar. One can view a month calendar here and record current events. 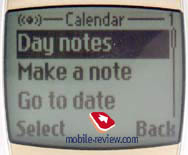 The phone enables to store 100-250 calendar records, it depends on their text length. A reminder (date and time) can be set to each record. It’s also possible to set a time, during which they will be kept, after this period they would be automatically deleted. IrDa. Activation and deactivation of IrDa. Bluetooth. This function is rather unusual. According to Nokia, the phone is comparable with Bluetooth accessories (for example, headsets) at the range up to 10 meters. Unfortunately, a headset form Nokia is unavailable, so we tested this function with a headset from Ericsson. We activate this headset and select Accessories search in the menu. The phone finds it rather quickly and offers us to connect. We agree. The connection is setup, but all disappointing will be further. This headset is operated at the range of 5 meters. I could walk and receive/reject calls. It is very convenient. All troubles began when I switched off the headset and after 2 minutes tried to turn it on again. The phone couldn’t find it, though I turned off the headset as accessory. Further attempts were also unsuccessful. At last, I removed the battery from the phone and then re-installed it, after that the headset was connected. In our opnion, it was mostlikey the problems of software. By the way, power consumption in Bluetooth-mode is higher. In case of 30 minutes of talking, the phone operates about 4 days. Extra. 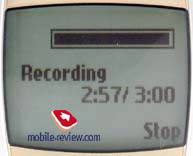 A voice memo, which enables to record up to 3 minutes of talking, is kept here. There are limitations of records number. You can listen to special records, give names to them and delete them. It’s very easy. 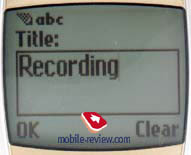 Press twice left soft key to start recording in the talking mode and in the end – one pressure to cancel recording. Up to 5 voice commands to enter several menu items (which are pre-defined) can be added here too. There is also a countdown timer, stop-watch (up to 20 intermediate records) and wallet in this menu. Wallet was appeared firstly, namely, in 6310. It allows to store information about your credit cards and create personal records. Wallet is protected by a special password. Services. Wap-browser in 1.2.1 version, which has standard features. You can also set wap-over-gprs. Reception and sound quality of Nokia 6310 are comparable to Nokia 6210. A small difference is explained by data scattering, which presents in the phones of one series. Voice sounds softly and vivid. If volume of the loudspeaker is the highest, one can hear some noise in loudspeaker. Compared to 6210, the highest volume of the loudspeaker and ringer was increased. Vibrating alert became stronger. It is felt even in the pocket of winter coat now. 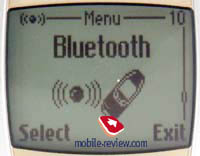 The phone supports GPRS(3+1), which enables to reach rather high speed - up to 40.2 Kbyt/sec. 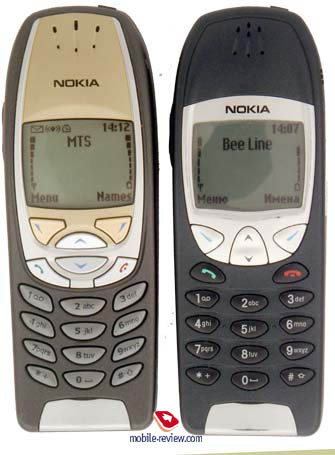 In reality (in Moscow, Beeline network) it was lesser, but there were no problems with it. To transmit data, you can use not only IrDA, but data cable (it is standard, DLR-3P). There is also a support of HSCSD (High Speed Circuit Switched Data). Standard delivery kit includes a CD with software “Nokia PC Suite”, which can be used to synchronize phonebook and calendar with PC. 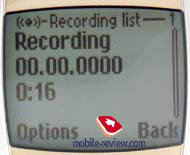 It is also possible to create ringing tones and download them to the phone and create SMS-messages. As you’ve already understood most of accessories from 6210 are comparable with a new model. It is an advantage for 6210 owners, which are going to change the phone. Lithium-polymer batteries are frost sensitive. One my friend left the battery in the car at night (temperature –28C outside) and the battery “died” there. Don’t forget about this fact, when you use the battery in winter. 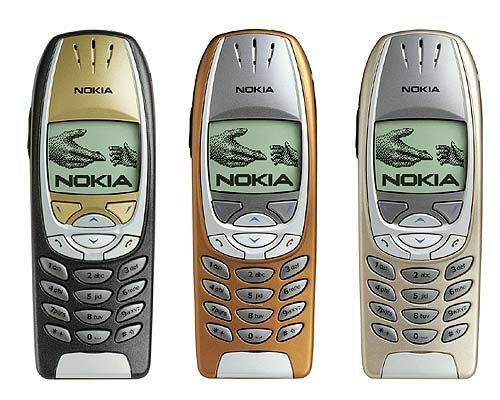 First price of Nokia 6310 was about 400-450 USD. Then, during three months it fell down to 350-300 USD. It is a balanced phone, which was launched a little bit later than its main rivals - Siemens S45/ME45. On the whole, all these models have equivalent functions, but Nokia loses in terms of price. S45/ME45 cost about 275-280 USD. Nevertheless, Nokia 6310 is a popular handset and it provides large sales. In conclusion we’d like to say that Nokia 6310 is rich and interesting phone. It is an ideal one to replace such phones as Nokia 6210, Nokia 7110. We think that users of other pone brands will be also satisfied with this model. If you are not afraid of phone size, 6310 is a good choice. SAR level is 0.81 W/kg (EU method).